In many ways, marketing is as much about human psychology as it is about actually selling stuff, and no one understood that better than the “father of public relations,” Edward Bernays. Bernays is the reason bacon and eggs is considered the quintessential breakfast, why we think most doctors recommend Ivory soap, and why, after a 100-year taboo, it suddenly became okay for women to smoke in public. 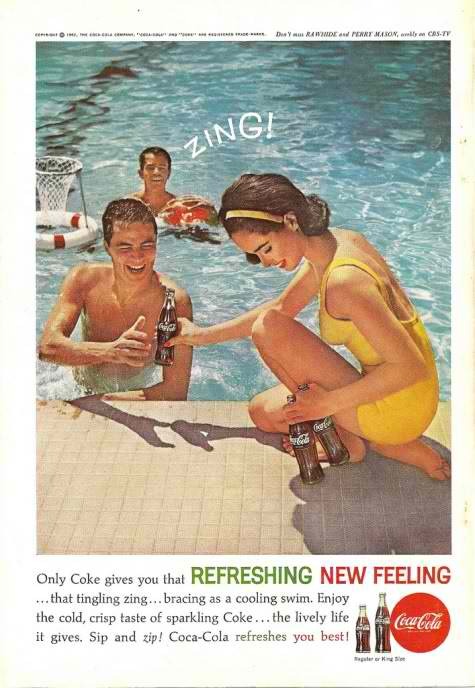 How was Bernays able to persuade people to believe all these things and much, much more? Because he thoroughly understood his customers and based his campaigns on their unconscious desires (the things that motivate them to buy). Of course, he had a little help with this from his psychoanalyst uncle, Sigmund Freud. Although Bernays’ heyday was in the mid 20th Century, his techniques are still valid in today’s internet-driven marketing arena, and that’s because advertising all boils down to how well you know your customers. However, there’s a big difference between just knowing your customers and really knowing their unconscious desires. For instance, you might adequately know your demographic, what they talk about, and what they buy, but do you know why they talk about certain things, what inspires them to buy a product, how a product makes them feel, etc.? Naturally, figuring all that out takes a lot of work, and the funny thing is, if you can do it, you may wind up understanding your customers better than they understand themselves. For example, researchers have found that most people don’t even know why they make a decision – they may think they know why and believe they’re formulating analytical decisions, but scientists say most decisions are finalized in our primitive brains even before our conscious brains have finished weighing the options. All of that’s to say, if you can connect with people’s unconscious desires, or their primitive brains, you’ll have a much improved chance of persuading them to buy your product or service. Fortunately, we know a thing or two about how optimized web design can make a huge difference in the persuasion process. Above all, people go to the internet to find stuff they want. It may sound simple, yet knowing that fact is essential since it reinforces the point that you have to make your site and its products things consumers want. Let’s assume your offerings are legitimately desirable… how are you going to portray this to visitors? By hiding all the best stuff in blocks of text or in buried pages? No, you’re going to put the most important information in bold and on the front page where it’s easy to find and see. We all know the internet is about speed, so it’s vital visitors can tell who and what you’re about within seconds of landing on your site. While most of us recognize that principle, there are still many who are missing the mark in regards to simplicity. If it takes more than a relevant image and a couple lines of text for visitors to get the gist of what your company does and why folks buy from you, then your message isn’t clear enough. 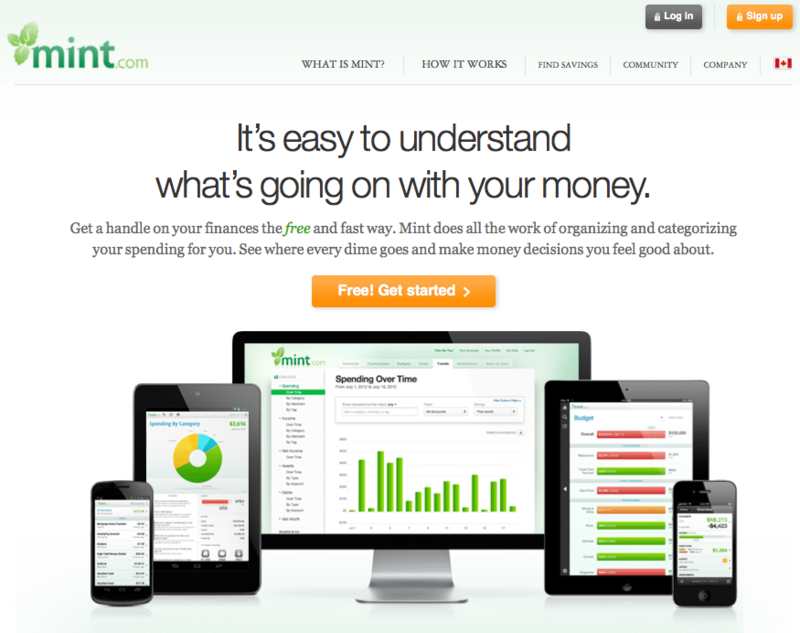 Crisp and clear design with a simple yet suitable headline and message. The homepage isn’t threatening or pushy, after all, they handle financial information -some products and services need to be sensitive about their target market’s perceptions. Perfectly executed call-to-action, “Free! Get Started,” and the image helps the visitor visual the “what”. Within seconds the visitor knows this is good for all devices. Great use of color composition. 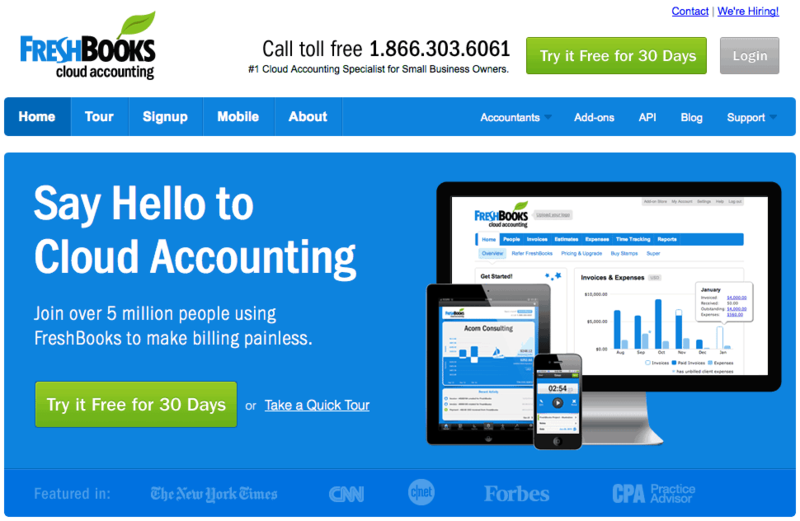 Compelling call to action: “Try it Free for 30 Days” -sense of “nothing to lose”. Good example of showcasing and a “threat proof” way to get started. In addition to keeping things simple and easy to comprehend, avoid using far-fetched or non-provable adjectives in your content, because, unless a customer is Buddy the Elf, he’s not going to believe you have the “world’s best” anything. Avoid saying meaningless things like you’re the “greatest,” “fastest,” or have the “best customer service,” and instead give them a fact which distinguishes you from the competition. For instance a bakery might advertise “fresh bread baked daily,” or a plumber might say “always on time appointments.” Such things are concrete selling points that tell why the business is special. 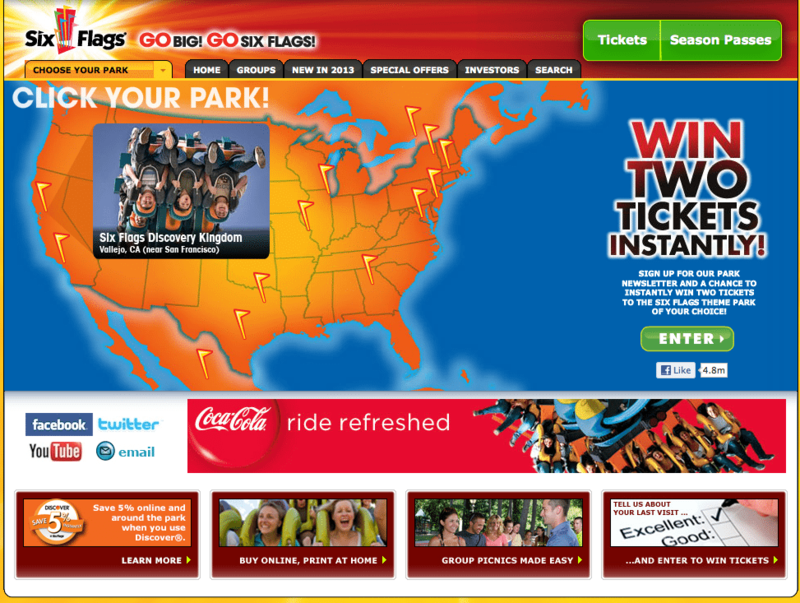 When visiting the Six Flags website the first thing you see is a giant map of the U.S. which shows the parks’ various locations. Perhaps Six Flags thinks proximity is its top feature, but choosing the map as the focal point sends an unclear message about what people can expect from the park. Instead of giving visitors an instant impression of the fun they can have, the map just lets people know how near or far they are from the park (which may be a deterrent for some). Meanwhile, all the images of guests enjoying themselves are small and less noticeable, and an explanation of what makes the park unique is decidedly absent. On the other hand, Disney knows just how to tug at a person’s heartstrings. 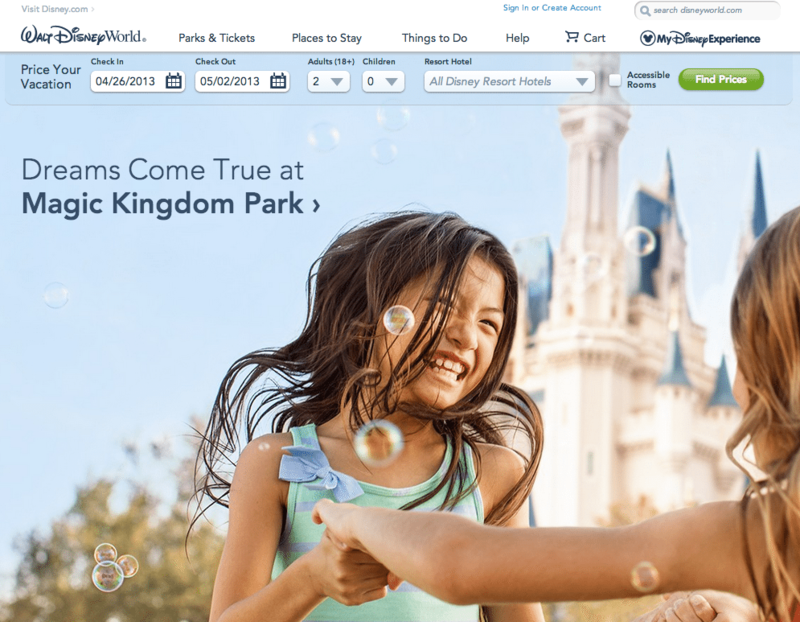 When you visit their Disney World site you’re immediately faced with large scrolling images of family fun and fantasy. Each alluring picture is accompanied with clear selling points, such as “Offer at Select Disney Resort Hotels – Save up to 30% – Get Details.” Even the headline “Dreams Come True at Magic Kingdom,” which may seem like one of those unbelievable things we said not to use, actually works because Disney is in the business of making fantasies come alive. Once you’ve come up with a clean, clear message for your home page, don’t stop there! Make all your pages just as intriguing and straightforward. Making sure people know what your site is about and convincing them it’s a place they want to be is only the first part of the battle. Next, you have to keep them there and push them ever further down the sales funnel. Again, don’t forget that consumers are making rapid, unconscious decisions about your site while trying to decide whether it’s worth their time. Having alluring pictures which depict things they want or want to be a part of is a great way to persuade them to continue investigating. On the front page viewers see delectable food, a family sharing a meal together, and the promise of two entrees for $25. Who wouldn’t want to hop into that picture? 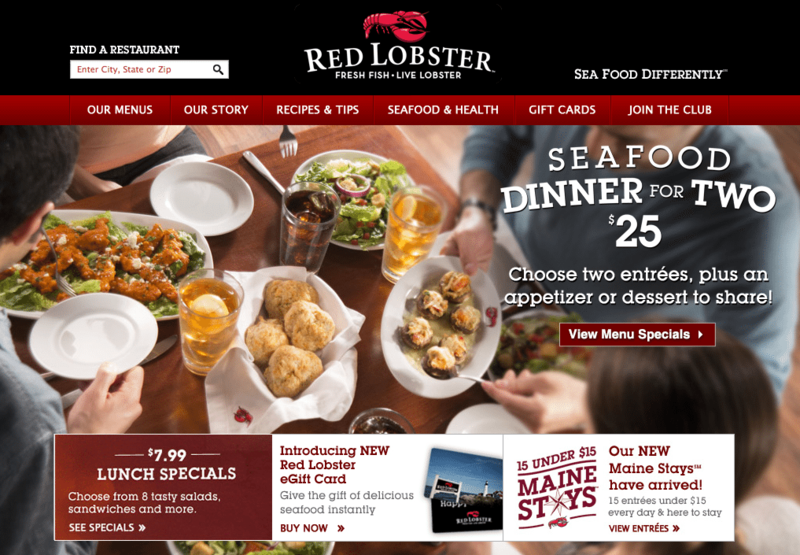 With just one image Red Lobster has effectively connected with food lovers, those who are family oriented, and people wanting affordability. While trying to express all those things in words would take multiple paragraphs, with an image and a concise headline, it only takes a glance to understand the whole message. Once you have an expressive image, don’t camouflage it by cluttering your page with a bunch of other unnecessary pictures, links, or ads. Even though you might think there are a ton of great things to say about your business, trying to say it all at once will only make your page look ugly and complicated. Instead, choose the most enticing thing about your business at the moment and use it as your main headline. Keeping things minimal and organized will encourage visitors to hang around longer and increase the likelihood they’ll click to other pages in your site. Research by Google shows exactly what internet surfers prefer in websites: simplicity and familiar layouts. In other words, limit the amount of actions per page, avoid clutter, and stick with what people know. Part of making things seem orderly is by using a visual hierarchy, so folks automatically zone in on the most significant thing on the page. If you already have clearly defined business goals then choosing how to rank your various page elements should be easy. Hierarchy can be made evident through the use of size, position, and color. 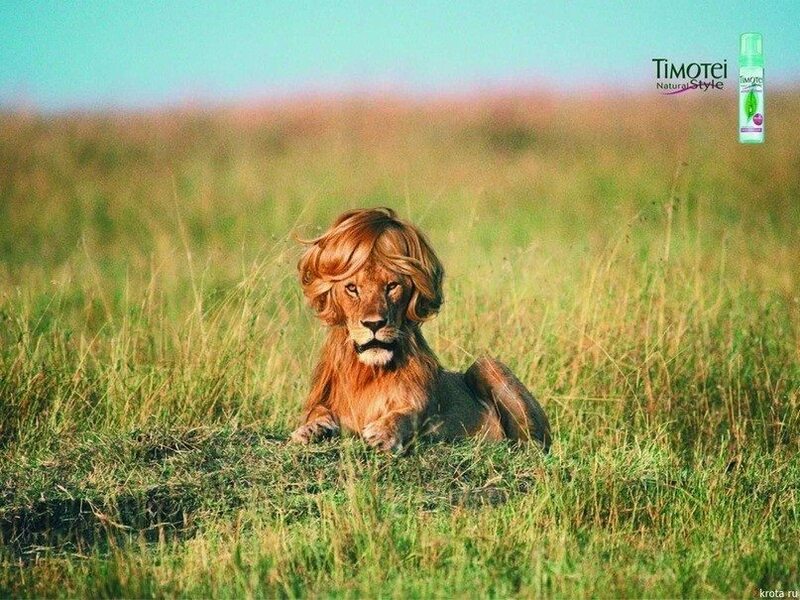 Make your primary image and/or message larger than everything else. Having an easy to navigate header is important when maintaining the appropriate visual hierarchy. So many times businesses try to fit in everything they can think of into the navigation. When creating an informational or news site this may be appropriate, not so much for a small business website. Dropdowns are a great way in keeping the visuals clear and keeping the prospect focused. Okay, so you have a clear message, visual interest, and appropriate hierarchy, what else can do to keep people’s attention? Even though first impressions count for a lot, you need solid, interesting content to convince visitors to stick around, buy, and return. Faces – Show the smiling faces of everyone on your team. Visitors love to see the people behind the business, and having up close and personal pictures helps to create a better connection between you and your customers. Real photos – Stock images look unauthentic and they give the impression you don’t have anything real to show off. They can certainly do the job, however having professional images done with you, your business location, your product and or service is always the best method. Whenever possible, use photos showing actual people, things, products, and places associated with your business. Be original – Whether it’s in the form of text, photos, or video, deliver unique content that shows your business’ personality. You can pique consumers’ curiosity by adding an element of surprise or by doing something different from your competitors. Also, make each one of your pages a little different, so people are continually engrossed as they click through your site. Focus on the consumer – Although folks come to your website to learn more about you, they’re not so much interested in your business as they are in what it can do for them. With that in mind, avoid self-centered talk “we are…” or “our mission,” and instead concentrate on explaining how things work and what consumers get when they buy from you. Limit choices – If you’ve ever been to a restaurant and were given a 10-page menu, then you know how paralyzing too many choices can be. The brain can only process so much information at once without feeling overwhelmed. Providing a search filter and limiting the number of actions you offer per page will result in more engagement. Close-up views of products – If you have an e-commerce store, try to recreate the experience of brick and mortar shopping by having clear, up-close pictures of your products. Since shoppers can’t actually pick up and feel your items, it’s important to show as much texture, color, and details as possible. Some sites provide 360 degree views of their products, which is a smart idea, yet even limiting the number of products per page and making the images bigger can make a big difference. You probably have more than one action you want visitors to take (e.g. subscribe, buy, sign up, etc. ), and it’s completely fine to have multiple calls to action, just make sure there’s only one per page. This ensures all your efforts are directed at the same thing and, again, it keeps people from having to make too many decisions at once. Also, ensure your calls to action progress naturally through your pages. In other words, don’t ask potential customers to sign up or buy something if you haven’t fully explained what it is. Your call to action should stand out and be at a point where the visitor knows what they’re “getting into”. 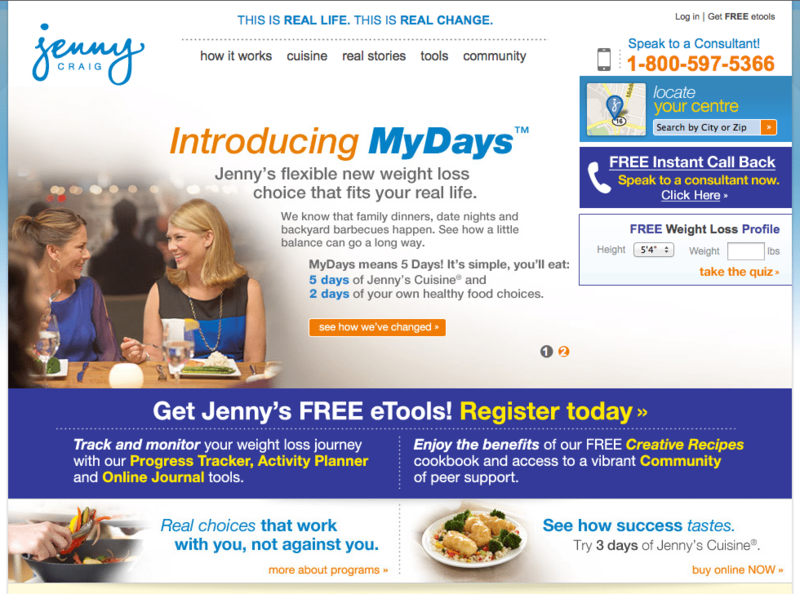 Jenny Craig, for example, is bombarding us with too many calls to action at once and before we really know what the program is all about. Should we “get the details,” “speak to a consultant,” “locate a center,” “register,” or follow one of the many other links on the page? If you’re like us, this page makes your head spin and leaves you wanting to get far, far away. It may seem logical to “cut to the chase,” but people are most likely to take action when their motivation is at the highest – not when they first get to your site. Remember, as Bernays proved, emotion often trumps reason when it comes to making purchasing decisions. This means, even if your site makes perfect sense to you, if it doesn’t resonate with consumers then sales will suffer. First impressions are your best foothold into their hearts, so use striking images that reflect what they want, where they want to be, or what they value. The WordPress content management system is one of the most easy to use platforms available. Not only is it easy to update content on a website without knowing much more than how to send an email but WordPress is also backed up by a virtual army of thousands of smart people.